Whether you’re renovating your forever home or you’re brainstorming ways to make your house more marketable to potential buyers, you have a plethora of design options at your disposal. Do you focus on curb appeal? Should you update the kitchen or maybe invest in newer appliances? To help guide your decision, consider that fireplaces are routinely on potential buyers’ lists of “must haves,” making fireplaces a hot commodity for homeowners and home buyers alike. Additionally, according to U.S. News and World Report, approximately 68% of surveyed real estate agents say that a fireplace is a sure way to increase a home’s value. Fireplaces are one of the most attractive features of a home, regardless of whether you’re buying or selling. 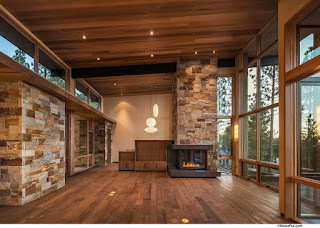 If you think you or potential buyers might enjoy a new fireplace but you’re torn on which kind to get, consider working with an experienced designer and manufacturer of fire features to determine what kind will best fit and add value to your indoor or outdoor spaces. After all, the best fire feature will be one you utilize and enjoy. While the right type of fireplace is entirely contingent upon your personal preference, desired ambiance, and budget, seek out an experienced fireplace design company that will work with you to create the perfect, customized solution to complement your unique space. Look for a company that offers a team of professional designers to help you create an innovative, efficient design that gives life to your vision. If you’re interested in upgrading your back patio, an outdoor gas fire pit is the perfect focal point to gather around on chilly nights. Work with a fireplace designer who will let you choose from a variety of customizable models that come in pre-assembled linear, circular, or arc-shaped designs. Look for an outdoor gas fire pit that is customizable, made with 100% stainless steel components, and can be delivered fully assembled. This will give you the freedom to select your desired size, configuration, and the right finish options such as marble, clad, stone, or tile. Work with a fireplace company that will also let you select your preferred media options, such as crushed glass, river rocks, or logs. Add a few chic pieces of furniture next to your custom outdoor gas fire pit to create the perfect ambiance that you or any future buyer can envision themselves enjoying. Interested in bringing more of that warmth inside and cozying up your indoor ambiance? A see through fireplace is the perfect way to create a welcoming space that adds a glowing warmth in and between adjacent spaces. A see through fireplace creates a clean, modern look in any room and is equipped with advanced safety features and glass cooling technology. 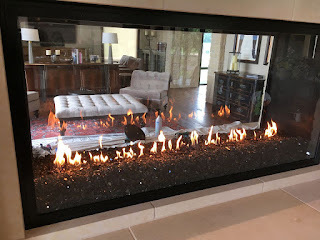 Work with a fireplace design company that offers customizable see through fireplace options and can accommodate any size or shape preference you have. An experienced company should have the ability for each design to be manufactured with open, sealed, partial glass, glass cooling, and air shield options. The best can even opt to include reflective porcelain panels within the firebox to reflect the flame. It doesn’t matter if you’re buying or selling, a fireplace is a valuable addition to any home. And with Acucraft Fireplaces’ lifetime warranty on custom fireboxes, you or any future buyer can enjoy your new fire feature for a lifetime. Acucraft Fireplaces can manufacture the fire feature you’ve always dreamed of, creating simple, modern, or classic designs backed by a team of skilled designers. 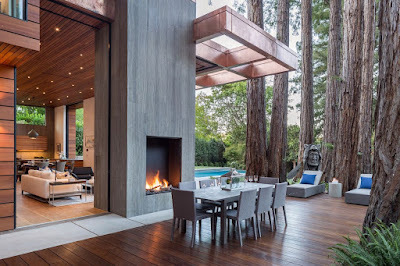 Their collaborative design team will help you find the perfect fire solution for your space, whether you’re in search of a traditional gas burning fireplace or an ultra-modern see through fireplace. Acucraft Fireplaces has been manufacturing and designing modern, innovative fire features that create major wow factor for over 35 years. They are committed to innovation, collaboration, and a continual investment in technology.